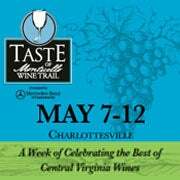 Taste of Monticello Wine Trail Festival - "The Grand Tasting"
Expanding to six days this year, the 2018 Taste of Monticello Wine Trail Festival presented by Mercedes Benz of Charlottesville will return to Charlottesville to celebrate the best of wines in the Monticello American Viticultural Area (AVA) of Virginia beginning Monday, May 7 through Saturday, May 12. Events will take place at the Jefferson Theater, multiple area wineries and restaurants, and Sprint Pavilion. Tickets on sale now at monticellowinetrailfestival.com and the Charlottesville’s Visitor Center on the Downtown Mall. Patrons will again have the opportunity to enjoy a variety of events available with optional VIP upgrades. 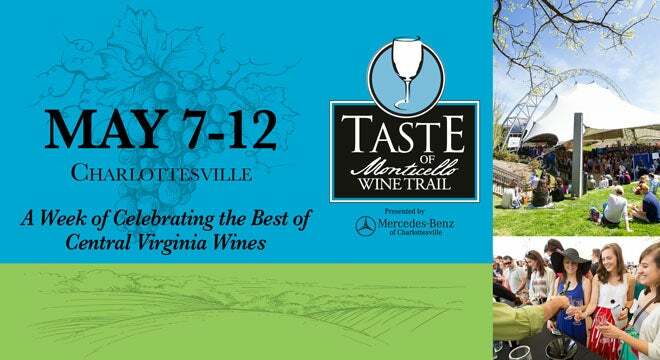 The Taste of Monticello Wine Trail Festival, an established spring tradition in Charlottesville, is a partnership between the Monticello Wine Trail, Sprint Pavilion and the Jefferson Theater, with presenting sponsor Mercedes-Benz of Charlottesville. The Monticello Wine Trail is a not-for-profit organization whose mission is to promote quality grapes and wine produced in the Monticello AVA. Dynamic winemakers, who are creating a unique wine region that features wines with an authentic expression of place, shape the region. The high quality of these wines is often recognized with success in national and international wine competitions. “The Taste of Monticello Wine Trail Festival is a great opportunity to experience a wide variety of what the Monticello AVA has to offer. It’s a chance to find your new favorite winery or wine, and our chance to share what we’ve been working on”, MWT President George Hodson. The 2018 Monticello Wine Trail Festival will feature 26 participating regional wineries and vineyards, including: Barboursville Vineyards, Blenheim Vineyards, Burnley Vineyards, Cardinal Point Vineyard & Winery, Chestnut Oak Vineyard, Delfosse Vineyards & Winery, Early Mountain Vineyards, First Colony Winery, Flying Fox Vineyard, Gabriele Rausse Winery, Glass House Winery, Grace Estate Winery, Horton Vineyards, Jefferson Vineyards, Keswick Vineyards, Kilaurwen Winery, King Family Vineyards, Loving Cup Vineyard & Winery, Lovingston Winery, Pippin Hill Farm & Vineyards, Reynard Florence Vineyard, Stinson Vineyards, Stone Mountain Vineyards, Trump Winery, Veritas Vineyard & Winery and Wisdom Oak Winery. An exciting event for the wine enthusiast, taste award-winning wines from the 2018 Monticello Cup Wine Competition alongside the wine growers and winemakers who made them. The night ends with the competition results for the Top 6 wines and winner of the prestigious Monticello Cup for the overall highest scoring wine. For event details and locations, visit monticellowinetrailfestival.com. Reservations are required for each dinner. Contact participating wineries. The 3rd Annual Monticello AVA Sparkling Brunch will be held at the Afton Mountain Vineyards' pavilion and feature sparkling wines from five area wineries all perfectly paired with a farm to table inspired menu. The Monticello AVA Rosé Lunch will move to Blenheim Vineyards this year and begin with a sparkling rosé toast! Next, four rosés will be paired with their own small plate making up a summery four-course lunch. The goal of the Sprint Pavilion is to provide a safe, enjoyable environment for all of our patrons, our performers, and our staff. With that in mind, beginning in 2018, we will enact new security procedures to make sure that prohibited or dangerous items are not brought into the venue. 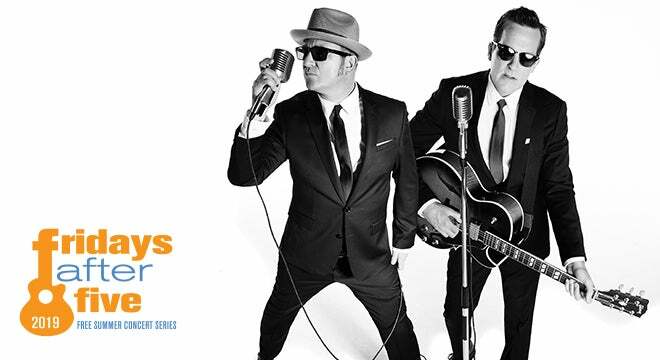 For all events, including Fridays After Five, patron points of entry will be limited and there will be a bag check for any packages brought inside the gates. We encourage our patrons to travel light but, if you do have bags or packages with you, plan for the entry to take a few moments as our staff inspects the bags. We appreciate your patience so that we can all feel safe. Unfortunately, we do not offer any bag check so please familiarize yourself with our list of prohibited items and leave them at home. For all ticketed events, we will be instituting a higher level of security. All patrons will be asked to walk through our metal detectors after emptying their pockets of any metal objects. Patrons may opt for a pat down inspection should they choose. We will have plenty of lines open and we hope that this procedure will flow smoothly and not delay your entrance to the venue. Should you bring bags with you to ticketed events, we will still need to inspect the parcel prior to you passing thru the metal detectors. Once again, we appreciate your patience as we work to ensure the safety of all of our patrons.